Zainab wrote about it as “flash fiction” for a class assignment and submitted it her senior year to the annual Scholastic Art & Writing Awards. Her fish story, along with several poems and an excerpt from a dramatic script, were rewarded with a $10,000 scholarship at the highest honor: a Gold Medal Portfolio. She recalls the moment she received the news. “When I won the Gold Medal Portfolio my senior year it was pretty shocking for me and eye opening just to see how much my writing had progressed, “said the 2017 graduate of the Creative and Performing Arts High School in Pittsburgh. She had entered almost every year since seventh grade, the first year of eligibility. Scholastic Art & Writing Awards is one of the largest international competitions for teen writers and artists–more than three million dollars are awarded annually in scholarships—says Laura Roop, the director of the Western Pennsylvania Writing Project (WPWP) a Regional Affiliate of the Scholastic awards. “There’s nothing that compares with this opportunity—and its always had a strong Pittsburgh connection,” she says. Pittsburgh pop artist Andy Warhol received a national art award and filmmaker Ken Burns also received recognition, and the first writing award winner was from Avalon, a suburb of Pittsburgh. The history of Scholastic Inc. began in Pittsburgh in 1923 after Maurice Robinson founded the Scholastic Publishing Company in his mother’s Wilkinsburg sewing room in 1920. He became a publisher of youth magazines to help children understand them world around them. 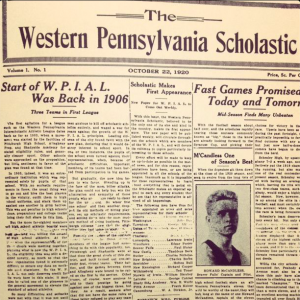 His first was The Western Pennsylvania Scholastic. The original magazine now has 30 various formats, both print and digital, for all ages and Scholastic Corporation is a multinational publishing company known for Harry Potter and Hunger Games series as well as elementary school book clubs and book fairs. 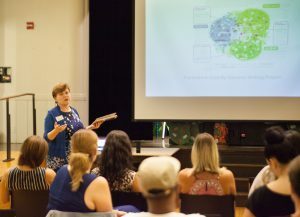 The Pittsburgh connection has increased in the past 10 years, says Roop, since the writing project site became one of the regional affiliates that provide 85,000 regional awards. There are approximately 2,500 national awards, each year, too, according to the Scholastic web site. It all begins at the regional level says Leslie Wesner, the current Greater Pittsburgh regional director, a WPWP Fellow since 2005. Local entries are judged by area teachers and writing professionals affiliated with WPWP or another locally recognized writing organization. “Judges are writers, teachers, journalists, professors: all of them sharing a passion for youth voice,” said Wesner. She, too, hopes more students and teachers learn of the opportunities that Scholastic offers. “Perhaps people think it’s too difficult–or that it’s for the gifted kids or literature students. That’s not the case,” she says. “There’s even a genre that just says ‘humor.’ That could lend itself to anything—even jokes,” she said. Regional affiliates, such as WPWP, also provide support and intentional outreach says Karen Howard, a WPWP Fellow who was the first coordinator of the program nearly 10 years ago. “It’s the inclusivity of all cultures and the commitment of the adults to this contest,” she said. “The stipends are small, but the rewards are great. It’s the encouraging teachers who have reached the voices that need to be heard,” she says. Christine Aiken Wolfe, a WPWP Fellow and published poet/author, agrees. She has served as a judge, as well as a consultant to after-school programs in underserved neighborhoods where students can have an experienced writer beside them as they make revisions. “It’s that kind of intentional outreach that has helped the contest to be more inclusive. It’s also exciting to see the caliber of work we are getting from these students–I have read pieces that have been phenomenal,” she said. The WPWP also sponsors the Young Writer’s Institute that is open to any student in grades seven through 12 “who likes to write,” says 2018 director Sarah Falbo. “There’s nothing else like this summer camp for students to develop their writing craft and voice—and it’s the perfect place to begin or polish an entry,” she says. 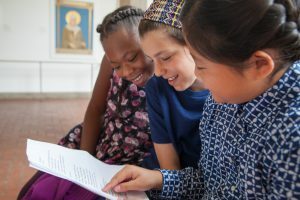 This past summer, at the two-week summer Young Writers Institute, held on the Oakland campus of the University of Pittsburgh, Zanaib spoke to the youngest of the writers gathered in the Cathedral of Learning during a break between a writing marathon and script editing. “I was your age when I began to write,” Zanaib told the 7th and 8th graders from 26 school districts, including home school settings, for several counties. She shared the same advice given by her teachers and drama coaches. “Revise, revise, revise,” the graduate of Pittsburgh’s Creative and Performing Arts High School, said with a slight laugh. 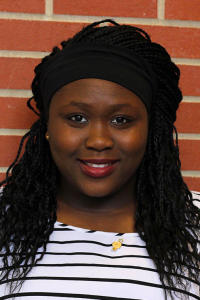 Currently a sophomore at American University, Washington D.C., she intends to major in International Studies—as well as to continue studying writing. “This poem is growing in a couple of ways. I actually just revised this one last semester,” she added. She also shared thoughts on fiction, memoir and poetry. “My mother always cooked fish. Growing up in American society, it’s not something that my friends talk about–It’s a really gross process,” she said. “I never wanted to learn how to do it. Then one day my mom made me sit in the kitchen with her. I was really upset at first. But then I was really happy that I got to learn more about her culture,” she said. Writing is about sharing moments in time, she added. 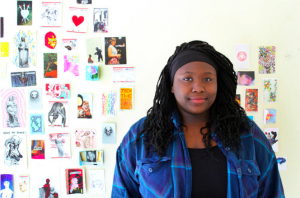 “It hadn’t occurred to me until high school to write about my identity. I’m definitely thankful to my family and to Scholastic for giving me that load of confidence,” she said. Submissions can be made through the Scholastic web site https://www.artandwriting.org/ from September through December. All regional awardees are automatically considered for national awards which provides both exhibition and publishing opportunities as well as the scholarships.